LED lighting is revolutionizing our cars and homes. Nowadays, every modern passenger car is equipped with LEDs. Headlight, brake and rearlight are sophisticated LED designs that include numerous LEDs and driving electronics. The design of power electronics for the LED driver and the thermal layout of the LED armatures are key to successful LED design. 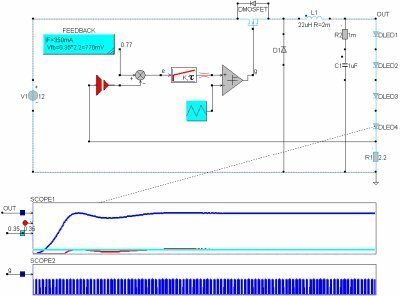 Detailed switched-mode-power-supply design in CASPOC includes modeling the power converter stage with all parasitic components, as well as the control, either by micro-controller or specific analog control IC.